When does progress not mean progress? For many it's the digitised life that has our phones perpetually glued to our hands. For others it's the introduction of new things in a more general sense. It's the reaction to the idea that 'new' equals 'good'. For purists of the spoken and written word, progress first meant 'text talk' (when ppl talkd lk ths) instead of talking 'properly'. Thanks to the widespread use of predicative text, these purists were saved from despair as language began to be more fully formed again. Alas, the purists got too comfortable too soon. Just as they thought we'd be on our way back to the Shakespearean tongue, something else was introduced - the emoji. Initially, it was a way to convey how you felt, or at most, add tone to a sentence. It could show humour where a 'lol' wouldn't do. Likewise, a simple solo emoji could say more than words could easily articulate. Rolled out globally, the emoji has had become an unpredictable success. It's become the common denominator. Not Spanish, nor Mandarin nor Arabic. Not English either. It's a language everyone can communicate with and can do so without traversing the tricky language barriers that, even when one can find the words, might mean that they are said 'wrong'. They've always been there. Before they were fully formed yellow faces, they were a simple ':)'. It done the job. Now we have water pistols, fireworks, flames and '100s' that are all taking on a life of their own. It's an interpretative form, as the 'praying hand' emoji has shown. It wasn't supposed to be a praying hand, nor a symbol of gratitude. Rather it was a 'hell yeah' of a high-5. 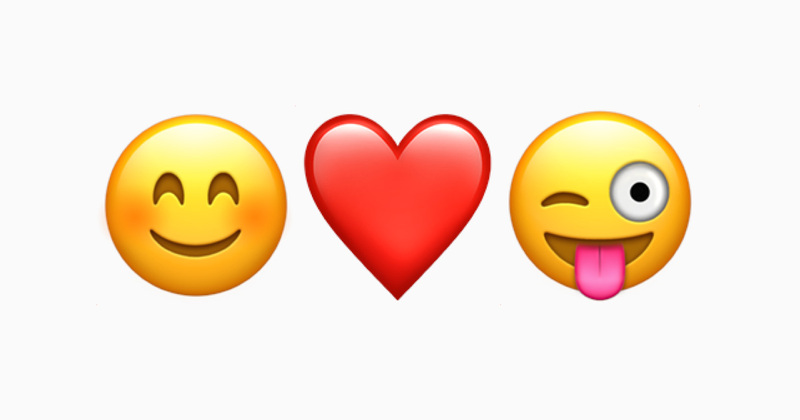 Intentional or not though, the emoji, much quicker than the English language (which thought that including 'selfie' into the dictionary counted as progress) has been evolving beyond the confines of embellishment and into a language of their own. Subsequently, it's taken over the world. These little yellow heads are not the first global language though. Esperanto was developed by Polish ophthalmologist L. L. Zamenhof at the tail end of the 19th century as a means of not just making communication across borders easier, but of uniting people in the process. Still the most widely-spoken constructed language, esperanto is spoken by around 2 million people globally with roughly 2,000 of those speaking it natively from birth. A political idea as much as anything, Esperanto is officially spoken at the Academy of Sciences in San Marino and the word itself means 'one who hopes'. What does emoji translate to then? Well it's an emotion, or more accurately an e-motion. Although that sounds like the most logical etymology of the word - it isn't true, rather it does display the versatile nature of language. It's similarity to English is in fact, pure coincidence. Emoji is translated from Japanese: e (絵, "picture") + moji (文字, "character"). Specifically, they are images that show emotions and had been used in Japan since 1996, before taking off globally in the 2010s, reaching their peak of pop-culture renown in 2015 when the crying emoji was recognised by the Oxford Dictionary as their annual Word of the Year. Devolved is a harsh way to explain conversations that are mainly conducted with emojis, but it's hard to escape the notion that they water down language. The capability of an emoji is heavily limited by interpretation, as fixed definitions hardly exist and even when they do (as in the case of the praying hand/ high-5) are just disregarded anyway. The emoji is an ideographic means of communication and is language-neutral, yet has its own inflection of colloquialism. Now, with a new pack being released and the 'pinching' emoji making the headlines (for all the right reasons), we see yet another example of them becoming more symbolic and 'advanced'. It is essentially, a very active language that is continually being adopted. Rarely, if ever, will a smartphone user not use them. So, it's bad news then? Yes and no. Language is a dear and time-worn construct that is imperative to our lives. It's not only a means of communication, but of thought. If a word describes an object, we can process it and think it. Objects that have come into life through being defined are the stuff of dreams (we can always describe a dream, no matter how weird). If there's no word to describe the object, then one will surely be made up and it's through its relationship as part idea and part language that innovation and human endeavour exist. Inventors think of something, think what it should be called and then make it. If they couldn't describe it, they couldn't conceive it and thus, couldn't begin to make it. Scaremongering aside, emojis never replace words. Just like robots will never replace people. That's not to say their uses will not continue to morph and adoption continue to increase, but they'll always fall short of the intricacies of words that provide a textured insight into self-expression. Instead of a separate idea to words, we'd be better seeing the emoji as a compliment to them. When we communicate digitally, nuance can be lost and to avoid obscuring our intentions, emojis are a simple way of clarifying what we mean. Language should always be economic and emojis help us with that. The fact that they help different languages communicate must be seen as a beautiful, yet unintentional, aspect of their creation. There's no body language on your messenger apps and thankfully something has come along to aid us there. Emojis, more than almost anything of recent invent, have aided our daily lives in unimaginable ways. They help us communicate more effectively, but more importantly, in a more human way. A photographic series explores our isolation in numbers.